I know most people begin their weekend with a drink, but I have a tendency to like to end it with a drink. I think it’s the ultimate way to wind down and end the weekend on a soothing note. So enjoy the last vestiges of the weekend and kick back with a little something sweet. If you want to be fancy you can put all the ingredients in a shaker with ice and give it a good mixing, Strain out into a glass. Garnish with lime. Lazy person way. Pour all into a glass give a stir, toss in an ice cube or two and garnish with lime. So obviously my recipe is for cherry, but I find all fruits are delicious so have fun throw in peaches and raspberries, blueberries, strawberries, or chocolate covered raisins. Heat oven to 325 degrees Fahrenheit. Line pan with parchment paper. Mix oatmeal, almonds, sunflower seeds, pumpkin seeds, wheat germ, cinnamon, and salt. In a measuring cup stir the syrup and oil together and pour over dried mixture. Bake in the oven for 30-45 minutes stirring occasionally so things don’t overbrown on one side. Let it cool completely. Toss in dried fruit. Store in air tight container/bag. Makes about 2 1/2 cups. 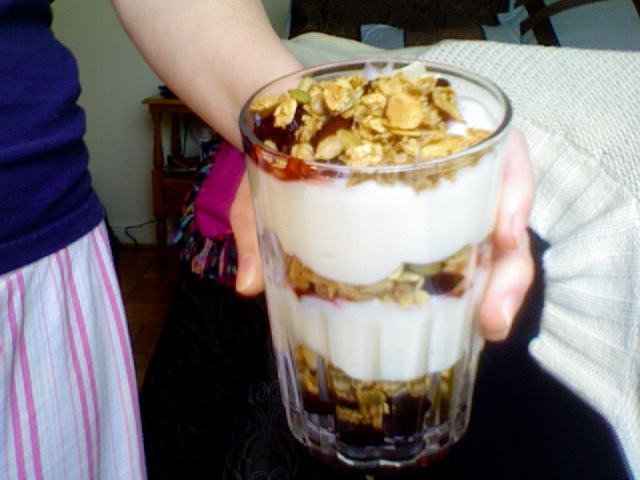 Layer in a glass or bowl, fruit, granola, yogurt, until you reach the top. Simple, but beautiful. This makes a really pretty dessert, too. Or you can set it out at a brunch 🙂 Enjoy! So when I see a recipe that calls for garlic I automatically decide I must make it immediately and well usually think the amount of garlic called for is never enough so I double it. The sauce for both the recipes below comes from the back of a San Giorgio pasta box. I find that some of my favorite recipes come from the back of a box. Anyways the recipes below are definitely not good for say date meals because it does not help for setting the mood later… even if you try to argue you both ate garlic so it shouldn’t matter. But that aside garlic is amazing. So get over the fact that these dishes will give you bad breath (perhaps one day a toothpaste will be invented to help with this problem) and just dig in and enjoy the sweet garlicky heavenliness of these dishes. Cook pasta according to box. Cook spinach according to box. When cooking is complete. Toss pasta, spinach, chopped tomato and sauce together. Or if you are going to plate individually you can do as I did in the photo. 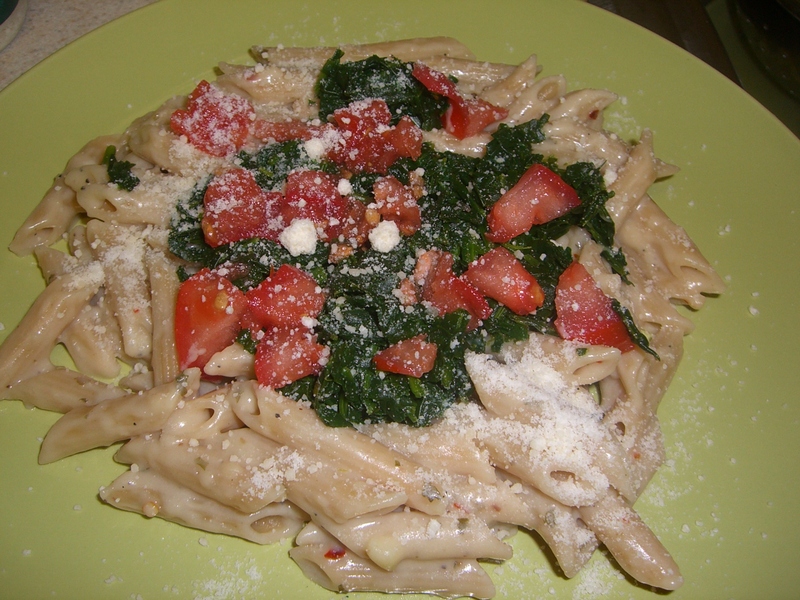 Toss pasta and sauce, serve on plate, layer with spinach and sprinkle with chopped tomato. 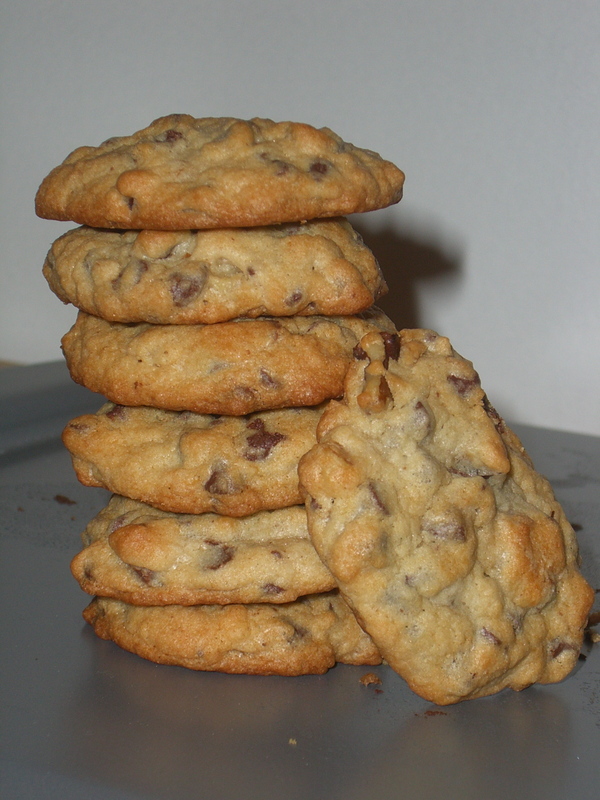 The recipe as written will serve 6-8 people. 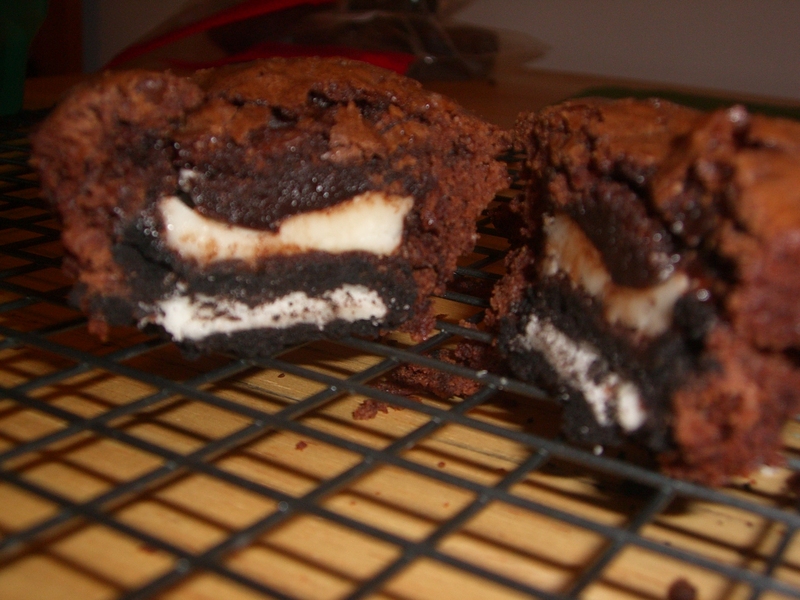 This recipe is fantastically easy, but looks elegant and taste delicious! Make sure you have your shrimp ready first you can leave the tails on or take them off. In the water you are preparing to boil for the pasta once it has reached a boil cook the shrimp first. Shrimp are done when they turn pretty pink and their tails curl so they are “C” shaped. Take them out of the water with a slotted spoon and set aside. You can also cook them in a skillet with some oil and garlic as well. I was going for simplicity. Once the shrimp are prepared cook the pasta. 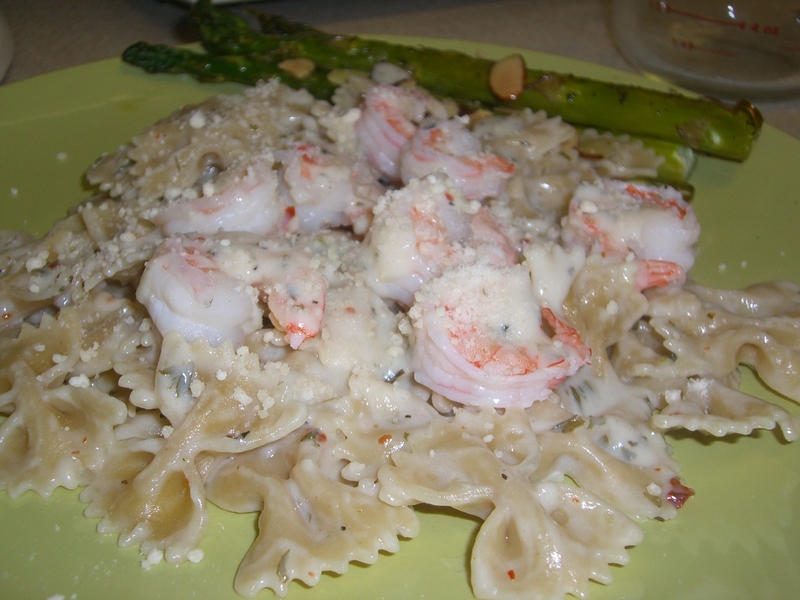 Toss cooked pasta in garlic sauce, reserve some of the sauce to pour over the shrimp you will place on top of the dish. Or you can just toss it all together especially if you took the tails off already. 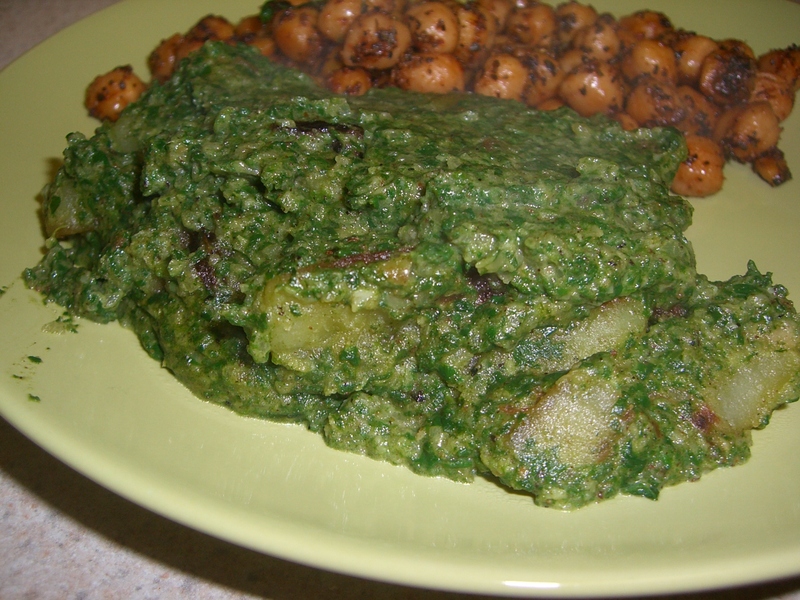 To add a bit of green to this dish I served it with a side of roasted asparagus and almonds. Toss the asparagus with a bit of olive oil. Bake in the oven at 400 degrees Fahrenheit for 10 minutes. Toss a handful of almonds on top. Bake for 5 minutes more. Delicious! On medium high heat melt the butter. Add the garlic and cook about 30 seconds until fragrant. Then stir in the flour, it should be smooth except for the garlic chunks. Add the milk and broth, bring to a boil. Stir occasionally. It will become a bit thicker in texture. Add the parmesan cheese to really thicken it up. Lastly stir in the parsley. Now I know I said I add the seasonings when I do the water instead of broth, but really, I do it no matter what. I like flavor and to skip on adding extra salt I just add other herbs. 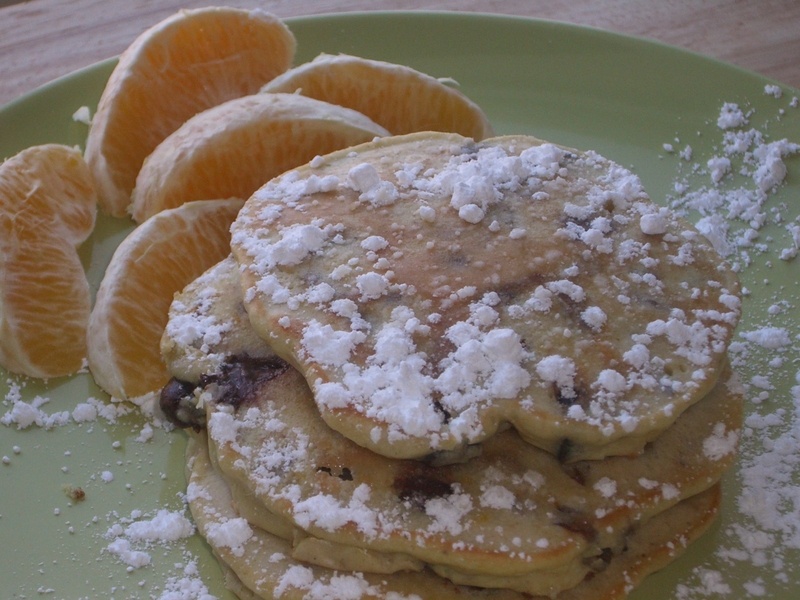 If your Valentine’s day sweetheart is a pancake addict like me this recipe is certain to have them swooning at the breakfast table or in bed (breakfast in bed, oh so cozy, makes you wish all activities could be brought to bed). These pancakes are super rich and decadant so make sure you serve up a big glass of milk to go with them. TRIPLE CHOCOLATE ORANGE PECAN PANCAKES!!! Whisk together pancake mix, egg, milk, orange extract, and orange zest. Stir in chocolate chips and pecans. Butter your griddle. I’m not going to tell you how large to make your pancakes, but if you make them about 1/3 cup size you will get 6 from this mix. To cook your pancakes cook it until the edges look firm and there are little bubbles starting to form in the center. Flip and finish cooking the other side. To serve, I recommend butter and powdered sugar OR you can look back at the ricotta pancakes recipe and make that delicious honey syrup. To enhance the orangeiness add some orange zest to that as well. Don’t let that orange you use go to waste; peel it and use it as a side of fruit with your pancakes 🙂 Enjoy!